TORONTO, January 15, 2018 – The first few weeks of winter in Toronto have left many dreaming of spring, but for apprentice jockey Isabelle Wenc, next season will bring more than just relief from the cold and snowy weather. It will bring the chance to fulfill her own dream. Despite a pair of major setbacks early in her career, the 23-year-old Saskatchewan native is determined more than ever to succeed as a Woodbine jockey when racing resumes in April. In 2015 as her career was beginning to pick up on the Alberta racing scene, Wenc suffered four broken vertebrae during a morning workout putting her pending plans to relocate to Woodbine at the time on hold. 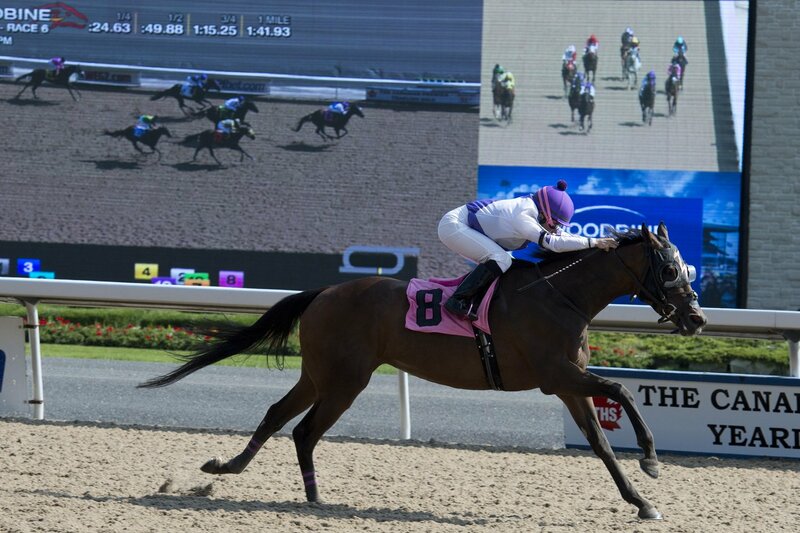 Once she recovered, Wenc eventually moved her tack to the Toronto track last year where she won her third start here on August 26 aboard Tornado Cat. But her first Woodbine season was cut short due to another serious injury. Wenc, who had picked up a few mounts at Fort Erie in the fall, broke her right clavicle and separated her shoulder when she was launched to the ground after her horse stumbled past the wire and catapulted over top of the jockey during the final program of the meet. The accident landed her in the hospital for surgery as her injuries required a plate and six pins for corrective healing, followed by months of physiotherapy. Through all of her highs and lows, the support of one young fan named Lily has given her the encouragement she needed during some difficult moments. Earlier this month, Lily came through again for Wenc, who received another uplifting letter from her pen pal on an off day during her road to recovery. Growing up as a city girl, Wenc’s love for horses was cultivated through horse back riding camps that she would attend during school breaks at Christmas time. The door into the world of horse racing opened one Sunday when she met trainer Maria Stanford while working at her mother’s beauty salon. It was during her summer at Marquis Downs that the former ballerina was repeatedly told she had the physique of a rider and discovered she could make a career out of being a jockey. After graduating high school, Wenc went to work at the racetrack climbing her way through the ranks as hot walker, groom and exercise rider before trainer Don Senebald took her under his wing in the summer of 2014 as she pursued her jock’s license. Wenc earned her license aboard one of Senebald’s horses and made her career debut with his trainee Lasting Cash, who was later their first winner together when she lost her 10-pound bug. From Marquis Downs, Wenc’s career took her to Northlands Park in 2015 with her sights set on a future at Woodbine, but those plans were put on hold after being sidelined in her initial accident. When she was cleared to return to action, Wenc resumed riding in Alberta for another season before making her move to Woodbine for the 2017 meet. “I’ve always dreamed of coming up to Woodbine so I thought now would be the time to do it,” she said. “I made the connections I needed to, got an agent, Neal Wilson, and I came out here and on my third mount I won my very first race at Woodbine. I have learned a lot from the riders here and fell in love with it. This entry was posted in Woodbine News and tagged Horse Racing, Isabelle Wenc, Jockey, Opening Day, Thoroughbred Opening Day Event, Woodbine. Bookmark the permalink.